The world’s most well known P2P Torrenting platform, BitTorrent has just opened its PayGate Premium Content Bundle, so that creative industries can directly release their content with little add-on costs. The company plans to take a minimal 10% cut from profits raised, which is a far better deal than other distribution platforms or streaming services such as Youtube, Spotify, VODO and iTunes. BitTorrent’s PayGate-based business model allows flexible distribution, with some content provided free and others behind a paywall. For example, you could provide teasers, trailers and BTS videos of your film for free, to allow audiences a taste of what your film is about, with the main feature safely behind the PayGate. It’s not all film though, a number of musical artists have already released albums using the BitTorrent business model. Radiohead frontman, Thom Yorke released his latest album Tomorrow’s Modern Boxes, was bundled with free music videos and singles, with the full album behind the PayGate, priced at a very reasonable US$6. Yorke’s album has been downloaded 4.4 million times since its release (at the end of September), and although he and BT aren’t disclosing how much of that was purchased, it still represents a significant profit without the distribution overhead costs passed onto fans. Californian DJ, Diplo has also just re-released a digital box set of his popular Florida album to celebrate its 10th anniversary via BitTorrent. Priced at US$5, the bundle includes nine free songs with a further twelve as purchasable premium content. “Taylor Swift sparked debate over the state of music in recent weeks; the value of a stream, the value of a record. The value of art shouldn’t be up for debate. It should be up to artists,” said Matt Mason, chief content officer for BitTorrent. 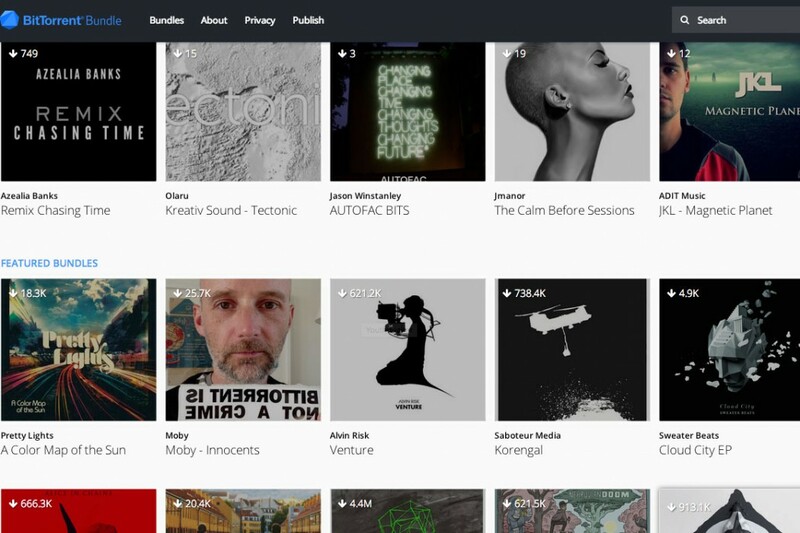 “Our goal with BitTorrent Bundle is to restore control to creators. We’re opening up applications for paygates to all publishers: allowing artists to sell content direct to fans, on their terms, while keeping 90% of sales revenue,” (source). 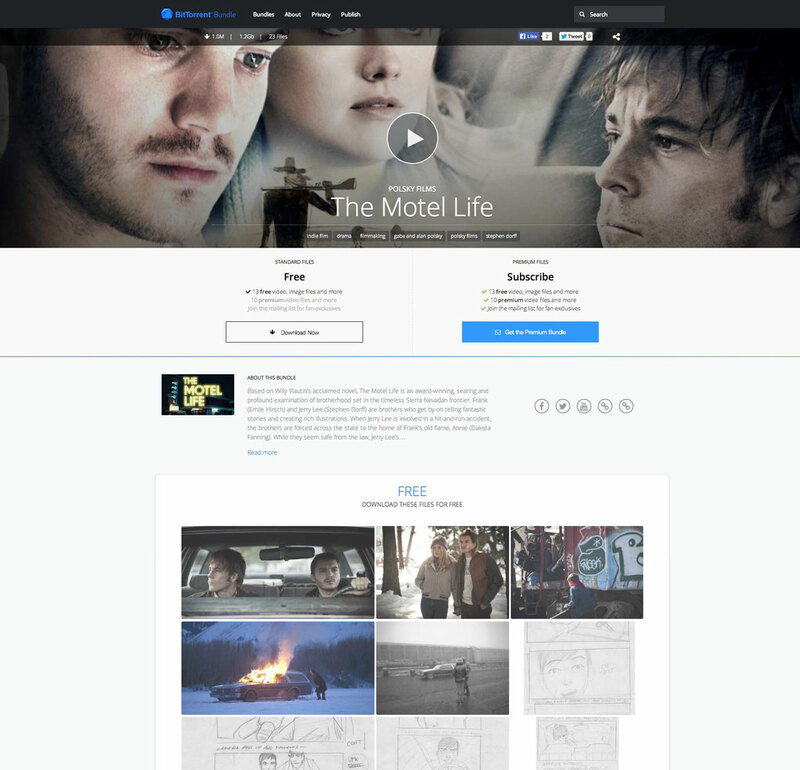 Polsky Films, ‘The Motel Life’ has already had over a million downloads. Already, there are a number of films available for purchase on the platform, with more being added daily. If you’re interested in distributing your work via BitTorrent, then you can fill out the BT application form here. There’s also a payment processing fee added to the cut taken by BT, but is usually under 5%, in addition to the already stated 10% cut. Content uploaded today won’t necessarily be released immediately, the company plans to roll out paygates in batches, to ensure that both content providers and audiences are happy. For indie filmmakers and musicians the BT business plan is a timely solution and offers a far better deal than other distribution networks. It also allows creatives to see exactly who’s buying their work and a demographic of their audience. Cinema Zero – A New Platform for Independent Film.